Although there were still a few fires to put out, my focus was now to change outward and to the future. The B5900, the machine that was not supposed to be because it was not needed, was now the machine everyone wanted. Not only that, the whole Computer Systems Group architecture roadmap was now called into question. John McClintock and I were summoned to Detroit for a series of meetings. Is the B5900 a unique, one shot design, or the basis for a future line of computers. We told them in no uncertain terms that the B5900 was the seed of the future of the company. On the hardware side, I told them the B5900 was not that great of a design. Since we were an unfunded project in the beginning, my hands were tied. I told them we could build a machine two or three times faster, at about the same cost, if we could use proven technologies like ECL. I told them we could build a family of high end processors faster than the B7900 and B6900, along with very low-cost machines using CMOS technology that would be competitive with the B1800 and B2800/3800 Medium Systems. John told them E-mode, and the microcode compiler, meant the corporation would truly have a common code base, not the “minor” variations seen between the B6000 and B7000 series today. Corporate Engineering, Sales and Marketing had a big question for John. The Medium Systems had a very loyal following of COBOL shops. Could the E-mode architecture compete with medium systems in COBOL? John said it could. Changes had been proposed for E-mode that would make it a better COBOL machine, but time and budget did not allow for the implementation. 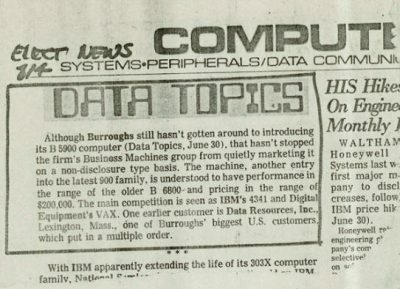 Shortly after that meeting Pasadena and Mission Viejo had a COBOL competition, and as I expected, the B5900 lost, but not by a large margin. 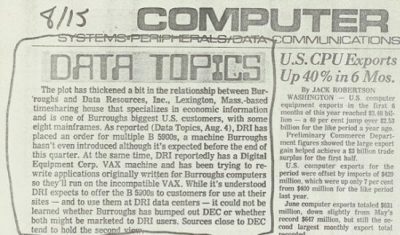 The Pasadena machines were completely optimized for COBOL, including decimal addressing of the disk! The down side of the Pasadena design is that it was not very good at executing the new, modern languages like Algol, PL/1, and the language soon to explode on the programming world, C++. 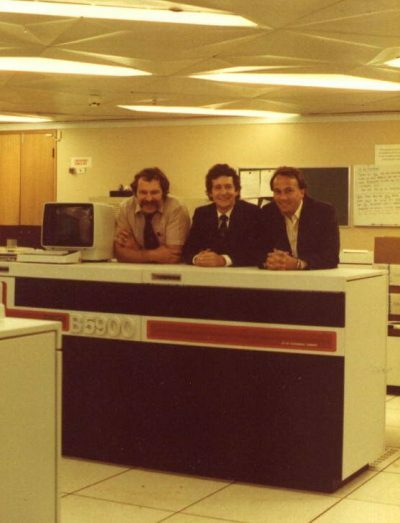 The Pasadena group was going to fight to keep their computer architecture alive, but the direction of technology was going to work strongly against them. The Santa Barbara group, on the other had, was ready to embrace E-mode for their next computer. Hans Birchmeier was the Engineering Manager of the plant, and Joe Trost was the General Manager. Hans was very interested in the details of E-mode and the B5900. The B1800 was in many ways similar to the B5900 from a hardware perspective, it used firmware extensively, but the hardware design was optimized for the conservation of main memory, or RAM. The B1800 was a “variable word length” computer; the compiler could create a one bit word, or a 100 bit word in memory. The hardware had to pack and unpack these variable words. The original design of the machine was considered innovative, cost effective, and original. The problem was the premise of the design, which was that RAM was expensive and needed to be conserved. At the time the B1000 series was conceived, main memory was magnetic CORE, which was expensive, and was not going to be significantly cheaper anytime soon. However, in the mid seventies semiconductor memory, DRAM was developed, and thereafter main memory costs began to plummet. It was clear to the Santa Barbara group, and too many of us at Burroughs, that the days of the B1000 architecture were numbered. So one of the results of our architecture meetings in Detroit was that I and some of my key engineers and programmers would visit Santa Barbara to educate them on the B5900. We spent a week in beautiful Santa Barbara going over E-mode, the concept of firmware emulation, and a vision for a complete line of code compatible mainframes for the next generation. Hans suggested we needed a new name for these computers, one that broke from the past because of the incompatibilities of the older, three architecture product line. It was decided to call the new machines the A series. The Santa Barbara machine would be the A3 and would use CMOS technology. We also outlined three other machines in the family, the A7 which would be a medium system, the A10 which would be a large system, and the A15 which would be the very large system.